Is there a way to get same archived in Windows. 00000040  5B 31 C0 8E D0 BC 00 60 8E D8 8E C0 BE DB 7C 2E  [1ÀŽÐ¼.`ŽØŽÀ¾Û|. 00000050  66 8B 8F 0D 00 66 09 C9 74 74 66 81 C1 FF 07 00  f‹...f.Éttf.Áÿ..
00000060  00 66 C1 E9 0B 2E 66 8B B7 09 00 E8 05 00 EA 00  .fÁé..f‹·..è..ê. 00000080  50 6A 10 66 31 FF 89 E6 8B 7C 10 66 39 CF 76 03  Pj.f1ÿ‰æ‹|.f9Ïv. 000000B0  CD 13 72 F0 89 F8 C1 E0 07 01 44 06 66 01 7C 08  Í.rð‰øÁà..D.f.|. 000000C0  66 59 66 29 F9 75 C1 83 C4 12 C3 BE E8 7C B4 0E  fYf)ùuÁƒÄ.Ã¾è|´. Sorry, just a senile moment. Ofcourse what boots in BIOS mode (isolinux) makes no difference to UEFI boot. I am not sure to understand your actual question, if any, iso-hybrid and EFI/UEFI booting are not the same thing, namely one thing is making a .iso EFI/UEFI bootable as CD/DVD, and another thing is making it bootable as hard disk image (i.e. making it a iso-hybrid), take some time on the above mentioned thread, check the little batches, you should easily get the hang of it. The *whatever* you posted a snippet of looks a lot like a GRUB2 No-emulation bootsector for CD (that has very little to do with EFI/UEFI and isohybridizing, that is the whatever is loaded normally on BIOS from CD/DVD), but the .iso you reference has been isohybridized using the GRUB2 MBR and a "fake" filesystem/volume using a partition ID of "CD" (you have to leave it to the good Linux guys and particularly to those working on or around GRUB2 to invent new "standards" ). There is no way that mkisofs will build a iso-hybrid .iso, as it simply "outside the scope" of the tool, what you will get hopefully with that command will be a dual boot (BIOS/UEFI) .iso, but NOT a iso-hybridized one (that will also boot as hard disk device, i.e. the idea of a iso-hybridized image is that can be mapped indifferently as CD/DVD device or as Hard Disk device). Yes, that command done what I set to get, which was iso bootable in either BIOS or EFI mode. Not a hybid at all then, but does the job. how that iso-hybrid was made. # generate the ISO hybrid image with xorriso. # "-as mkisofs" emulate the behavior of "mkisofs". xorriso is the Swiss knife for #handling iso/cd, it can also emulate other cd utils like #"genisoimage","cdrecord","wodim",etc. # "--sort-weight" the higher the weight, the corresponding files will be flashed with lower LBA, a.k.a near to the beginning sectors of CD-ROM. So files under "/boot" will be put before file directly under "/". #"--protective-msdos-label" generate a partition table in embedded hard disk image so that other normal disk partition tool will think this disk could not be manipulated. #"-boot-info-table" patch an "EL TORITO BOOT INFORMATION TABLE" into "eltorito.img". The U in GRUB2 seems to shift everyday from meaning "Universal" to meaning "Unique", this is IMHO very sad . iso I created as per post above (with mkisofs ) boots fine in physical machine & Workstation 11, but in VB it gives "unknown filesystem". Maybe it is VB issue then (is that what you used above?)? MBR is read by PC-BIOS when booting from USB stick or hard disk, and by PowerPC CHRP or PReP when booting. An MBR partiton with type 0xee indicates the presence of GPT. Emulation -as mkisofs supports the example options out of the ISOLINUX wiki, the options used in GRUB script grub-mkrescue, and the example in the FreeBSD AvgLiveCD wiki. Adopted from grub-mkisofs are --protective-msdos-label (see -boot_image grub partition_table=on) and --modification-date=YYYYMMDDhhmmsscc (see -volume_date uuid). 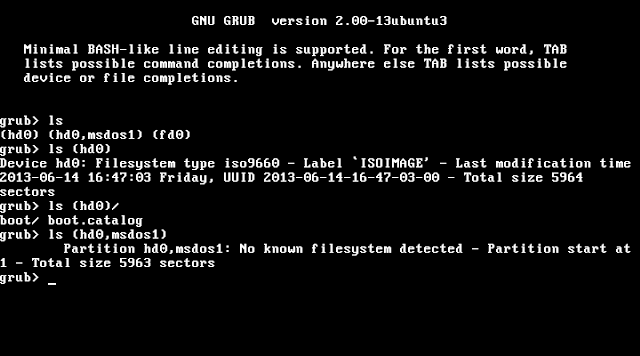 For EFI bootable GRUB boot images use --efi-boot. It performs -boot_image grub efi_path= surrounded by two -boot_image "any" "next". SUPERGRUB2 disk creation is not really explained well, run make from git is not much of an explanation. before xorriso, another (again IMNSHO senseless/only contributing to add to the confusion) program was written genisoimage that also misses this feature and that for whatever reason was adopted by a lot of the good Linux guys, and it is a (sad ) example of what kind of mess can be created out of nothing.